A pyrotechnic system that shoots fire above the roof of the pool deck. A larger DJ booth surrounded by 14,000 LED lights. The stage’s new overhead structure features movable LED video screens that not only rise up and down, but also rotate in all directions. A double kabuki drop in front of the DJ booth featuring projection-mapped video content that will allow for a dramatic intro for headlining DJs. Massive LED node details that cover the entirety of the club (including over the pool) and which pulsate and change in coordinated color patterns in time with the music. An extension of technology and lighting into the outdoor pool area, including screens on the outside of the club. Lasers and LED marquee-style string lights float from the palm trees to the bar soffit and around each cabana creating a unique pixel mapped detail over the pool. Four full-color crowd scanning lasers and fixtures, including Chauvet Nexus AW 7×7 LED panels, Clay Paky A.Leda B-Eye K10, Elation Platinum SBX Pro spot/beam and Martin RUSH MH-5 Profile. A one-of-a-kind video screen design over the DJ booth, incorporating a three-dimensional cubic layout. The video in this structure has been mapped pixel-perfect, enabling custom effects that are made specifically for the DJ booth. “Our vision was to go into this new era of EDM and have the best visuals,” says Jesse Waits, managing partner of XS and Tryst Nightclubs. “We made it so you can change the elements for each DJ, customize sets for each DJ and make atmosphere and mood changes. The upgrades were constructed over a four-month period, during which the club built the new features without disrupting the venue’s normal operating schedule. Waits said Insomniac’s Pasquale Rotella had recommended SJ Lighting for the job. 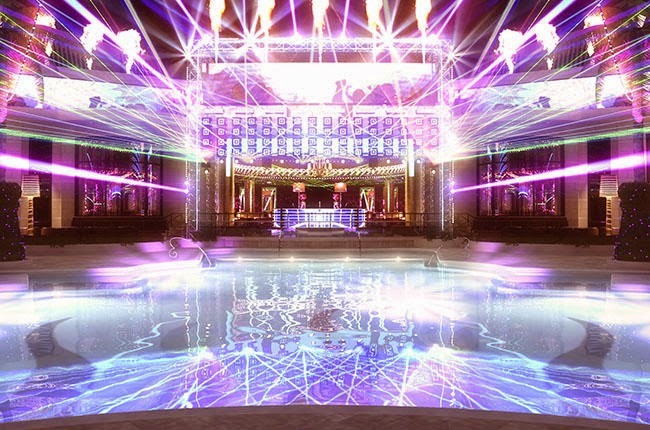 Acknowledging that XS originally made its name on its scenic setting and atmosphere, Waits said the club had waited to see the setups of nightclub newcomers like Hakkasan and Drai’s before making its move. Watch DJ Premier and Miguel's New Video For "2 LOVIN U"